Now that you have the ability to create push notifications you might be wondering what are the best practices? Check out our top 7 tips for becoming a savvy mobile messaging extraordinaire! People are busy and attention spans are short. 10 or fewer words is the sweet spot! 2. What’s your wow factor? When sending a message make sure it always is promoting an item, sale, event, tasting etc. We don’t want to spam the users, so making the message meaningful and beneficial is key. The best mobile marketers avoid creating noise but instead deliver thoughtful, creative, informed and strategic messages to the user. Create a Title for your message: This will show up in bold on the push notification. This is a good place for your Wow Factor. Use the Message space to write the details of your push. You can skip subtitle. 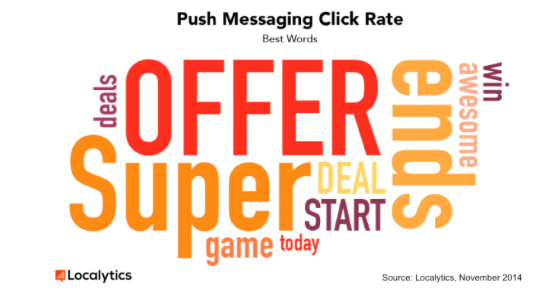 It is proven in mobile messaging research that words matter. We want messaging to promote an action, and the words included in your message will either get users buying or swiping left. The most successful words in mobile messages are “off” and “come.” Using a message that promote “X% off a product this week” or “come over to Joe’s for a free tasting” are sure to be winners. The best day to send a push notification is Thursday, and the most responsive users (ie: the most clicks) happen between 10AM and 1PM. Probably when most people are stuck at their desk dreaming of a cocktail. At Drync we have found the most successful campaign at driving sales are the combination of simultaneous emails and pushes. Imagine the scenario: an amazing wine comes in at a great price. You want to get that wine out the door, and you need to communicate it fast. So you quickly send an email to your subscribers (including your app users) promoting the product and right after you send out a push notification with the same information. We have seen this strategy drive THOUSANDS of dollars in sales. Don’t underestimate this powerful partnership in your marketing toolbox. Localytics provides several tools for analyzing the effectiveness of your campaigns. After you send out a campaign, check back on the campaign to view total sends, open rate, click rate and rate of conversions. Looking for additional help? Check out our blog for a how to on the details of crafting a push notification.